“2.0” as an epithet has become, to say the least, over-used. Indeed, Web 2.0 is exceedingly over-used, while Enterprise 2.0 is just pretentious. Aging 2.0 and Green 2.0 are kind of confusing. Now, Python 2.0 is a genuine improvement, whereas Keurig 2.0 is downright gimmicky — while Minecraft 2.0 turned out to be an April Fools’ joke! Thus, dear readers, we will not be announcing One-to-One 2.0! Indeed, we will take a page from that august organization, Microsoft, who has informed us that 10 follows 8. Ta DA! In this week’s blog post, then, we will describe One-to-One 3.0 — the worthy and exciting successor to the current 1-to-1 1.0. 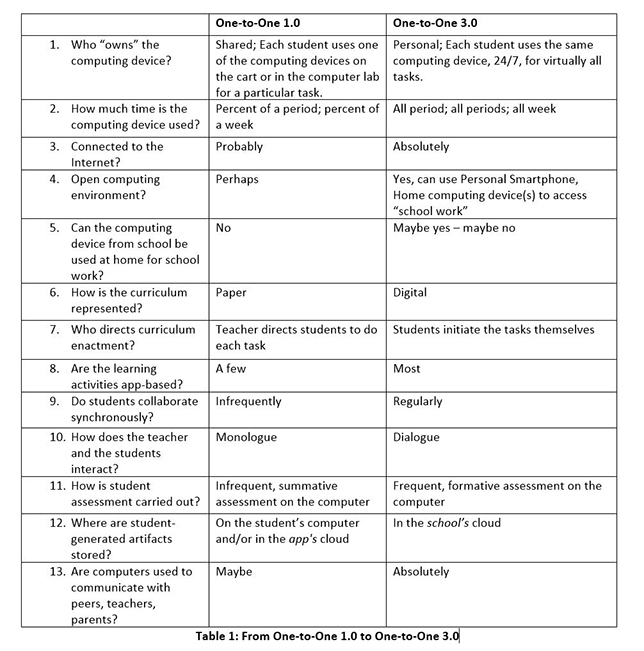 That is, in this blog post we will compare and contrast 1-to-1 1.0 — where each K–12 student in a classroom is equipped with a computing device, with 1-to-1 3.0 where each K–12 student in a classroom is equipped with a computing device. Hmmm. The cart — Version 1: A classroom set of computing devices (e.g., iPads, Chromebooks, laptops) is wheeled into a classroom and used for 40 minutes or so during the school day. But, that same cart is then wheeled into other classrooms over the course of the school day to be shared with the students in those other classrooms. The lab: A set of computing devices stays in a room while classes of students do the wheeling in and out over the course of the school day. The cart — Version 2: The good news: That classroom cart of devices stays in one teacher’s classroom. The bad news: The classroom set of devices is shared with the students that, again, wheel themselves in and out, period after period, during the school day. There may be a cart/lab for a grade level or a cart/lab for a floor in the school. For these 1-to-1 1.0 implementations, getting access to computing devices, then, entails teachers signing out the cart/lab — which can be a real challenge. Oh, add in this wrinkle: In some schools using the cart/lab for standardized testing takes precedence over curricular use. Given this wrinkle, then, a cynic might even label (1) and (2) as 1-to-1 0.0 – since in those schools where testing takes precedence, it is virtually impossible to gain access to a set of computing devices on a regular basis. But, change is coming! In fact, there are already some K–12 classrooms and schools where there is no sharing of computing devices, where the conditions in the first three rows of Table 1 for a 1-to-1 3.0 implementation are met. In those classrooms, then, teachers can count on each student having access to an Internet-connected, computing device all day, every day. Pedagogically, what might 1-to-1 3.0 support? See rows 6-13 in Table 1, please. As opposed to the classic “sage on the stage,” the 1-to-1 3.0 classroom can be organized into workgroups — groups of two to three students working together collaboratively. Dialogue, not monologue, becomes the preferred mode of communication. Learning activities — and conversation — revolve around the co-production of artifacts. Inquiry, directed by the student, is the new normal, then. For an example of what students can do in a 1-to-1 3.0 classroom, please see Gabe DellaVechia’s blog post about his third grade students co-producing all manner of artifacts. That said, 1-to-1 3.0 is a work in progress. While ready-at-hand access to computing devices is a necessary condition for the 1-to-1 3.0 classroom, and while such universal availability is within “smelling distance,” such access is not a sufficient condition to enabling the pedagogical practices identified above. The careful reader will have noticed our use of the term “might” when we spoke of the pedagogical changes supported by 1-to-1 3.0. No, technology alone is not enough to create the 1-to-1 3.0 classroom. Curriculum, curriculum, curriculum and teachers, teachers, teachers are also necessary conditions. Fair enough. Table 1 is the rubric that will guide K–12 towards creating the 1-to-1 3.0 classroom!